There was just a group of Florida researchers here in California sharing their experiences with ambrosia beetles and a fungal disease in avocado and other members of the laurel family. This is a pest/disease complex similar to that found here caused by a shot hole borer and fusarium. 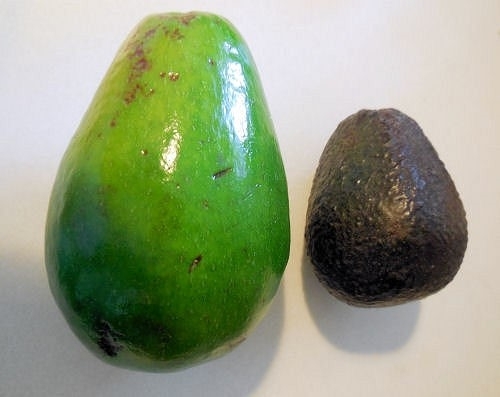 Avocados grown in Florida are of the West Indian or West Indian cross with Mexican or Guatemalan varieties. They are usually big, green fruit that tend to be of a lower oil content. Some marketers promote them as “low cal” or “slimcados” as a result. Whatever. One of the things that struck home during these wonderful talks was the pronunciation of the word Hass. It was “hozzz”. The “a” was pronounced like the a in hot, not in hat. It made me think that this is probably how our familiar fruit is probably pronounced in much of the US. I also hear Californians (and CA growers, too) pronounce this iconic fruit “hozzz”. The generally accepted pronunciation of this name is “HaaaaSSSSS”. Like in the verb “has” - “He has an avocado”. The fruit variety was found by a California grower named Rudolph Hass in the 1920's. The name Hass is of German origin. How it has come to be pronounced differently from his name is not clear to me. According to Google Translate, even in German it is pronounced as “has”, though with a somewhat clipped “s” on the end. And not only has the pronunciation of the name been changed, sometimes the spelling in many produce departments is “Haas”. I once saw it on packaging spelled this way and when I asked the produce manager how that had happened, he told me that they had asked the packer explicitly to spell it that way because that's the way the consumers wanted to see it spelled. So, the consumer drives the market. Maybe how people say it isn't important, as long as they know what they are buying and enjoy the fruit. At least most Californians seem to know how to say the word Hass.